Year of foundation: 2004 . Separate Subdivision Moskalvo Port is located on the western coast in the Northern part of Sakhalin island. This is the only northern port in Sakhalin region. Navigation period here lasts from the middle of June until October 30th if ice condition allows. In 2004, JV LLC «Sakhalin-Shelf-Service» started working in Moskalvo port under “Sakhalin-5” project («Elvary Neftegas» - alliance of NK “Rosneft” and “British Petroleum” ) to support marine geological exploration operations. In 2006, JV LLC “Sakhalin-Shelf-Service” became the owner of onshore property and building. After that, the company started port reconstruction: berths and territory adjacent to them was repaired, utilities were replaced. There is a shore base in Moskalvo port, which supports “Sakhalin-3” project (operators: LLC “Gazpromgeologorazvedka” and LLC “Gazprom Flot”). Shore Base provides drill waste treatment services and supports new projects on Far East shelf and on Sakhalin. 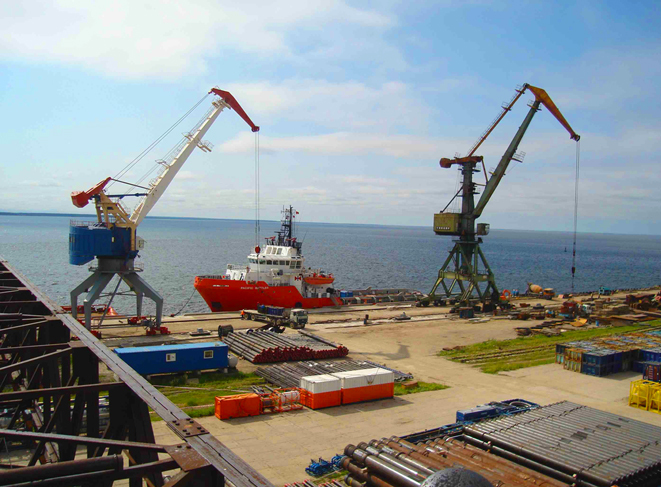 Being the only port in the northern part of Sakhalin island, separate subdivision Moskalvo port plays important role in life support and procurement of all people, living in the North of Sakhalin. Three berths: 80м, 130 м and 180 м long. Three covered warehouses, S= 1145 м2; 1283 м2; 2160 м2. Open storage areas, S=more than 20000 м2. Port cranes, capacity 20-40 tns. Trucks, capacity up to 20 tns.